Before starting his tenure here, Singaporean Ambassador Yip Wei Kiat took a semester learning the Korean language at a university in Seoul four years ago. Now nearing the end of his ambassadorship, he can read and write Korean, even if he is not fully cognizant of the meaning. 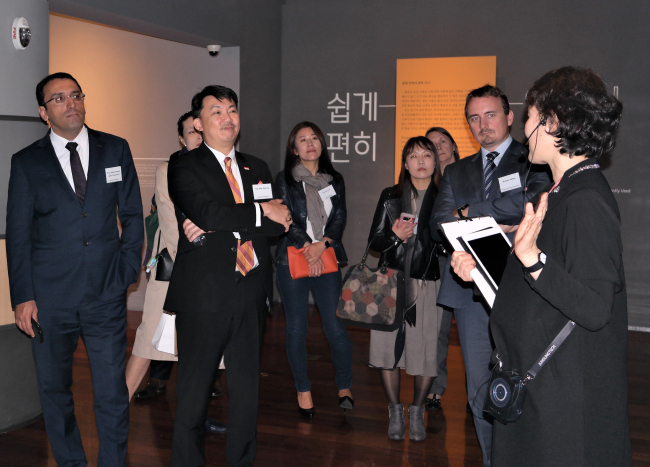 “King Sejong’s creation of Hangeul is amazing, because it provided opportunities for all Koreans, including the commoners, to learn their own language,” he told The Korea Herald during a tour of the National Hangeul Museum in Seoul on Oct. 23. Yip, along with foreign ambassadors, corporate executives, artists and journalists, participated in the CQ Forum event organized by the Corea Image Communication Institute. The forum serves as a year-round networking platform for opinion leaders here. The event followed the annual Hangeul Day on Oct. 9, which celebrates the creation of the Korean alphabet by Joseon’s King Sejong in the 15th century. The alphabet consists of 14 consonants and 10 vowels, and its letters are grouped into syllabic blocks, vertically and horizontally. Some linguists consider it among the most phonologically faithful writing systems in use today. An interesting feature of Hangeul is that the shapes of its consonants seemingly mimic the shapes of the speaker’s mouth when they are pronounced. “I know that Korean aristocrats and the nobility used Chinese alphabet, which is difficult to learn even today. But Hangeul is an easier, scientific writing system based on phonetics,” said Yip. Unlike Korea, a nation largely homogenous in terms of ethnicity and language, Singapore’s turbulent course of multicultural nation-building came about with the adoption of four official languages -- English, Mandarin, Malay and Tamil. The envoy gave a piece of advice on promoting Korean culture worldwide. “Language being a transmitter of culture and heritage, the Korean Wave, or Hallyu, cannot be only about popular culture. People around the world can learn more about other diverse and deep aspects of Korean culture,” he said. Latvian Ambassador Peteris Vaivars said that through CQ events, he learned how Hangeul can be expressed in highly creative ways through calligraphic art. When it comes to language and the preservation of culture, Latvia and Korea share many similarities, according to the envoy.